We LOVE fall…cool and crisp air, football, leaves changing colors, and PUMPKINS!! After seeing so many cute fabric pumpkins in blogland last year, we decided to make our own and have brought them back again this season! 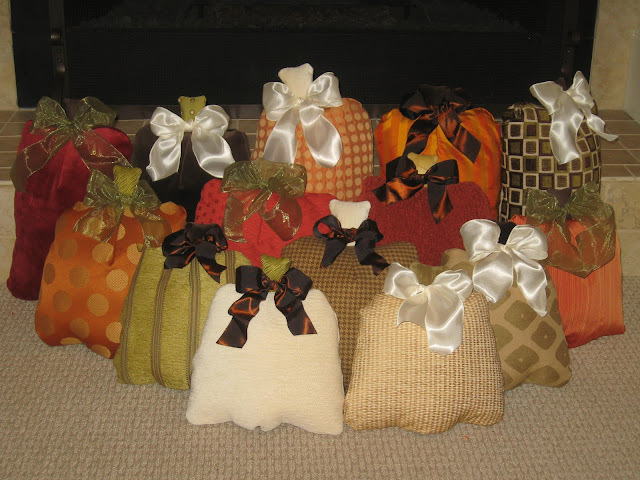 We have used gorgeous, simple home decor fabric and delicate ribbon to put a very upscale twist on our pumpkins. These become a part of your decor, not just decoration! Uncommon Featured on “Reviewed By Mom” ! These are so cute, I really like the orange polka dot fabric. The satin bows are the icing on the cake :). Fabulous! These are great! Looks like you are ready to sell them. Oh, my gosh, how cute! I’m totally borrowing this idea. 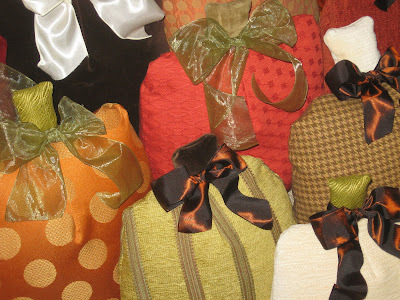 I love to put seasonal pillows out and these are so unique! very pretty pumpkins! I think your blog is lovely so I gave you an award. Well, aren’t those just adorable! This is amazing just beautiful! I’d love for you to link up with my Pumpkin theme link up party this week. Very, very pretty pumpkins! Great idea! I’m visiting from Making the World Cuter. Have a great week!